The call addresses the mystical marriage of the inner masculine and feminine principles and how it gives birth to a third principle which will uplift humanity and heal the Planet. The call addresses the conscious evolution of human sexuality and how it is affecting the healing of the Earth and humanity. When the soul entered into the dimension of space and time we had to have both the vertical and the horizontal axis - the cross of matter. This is when the soul split into two parts and became the Primordial Adam and Eve, with one plane representing the mind and one plane representing the heart. 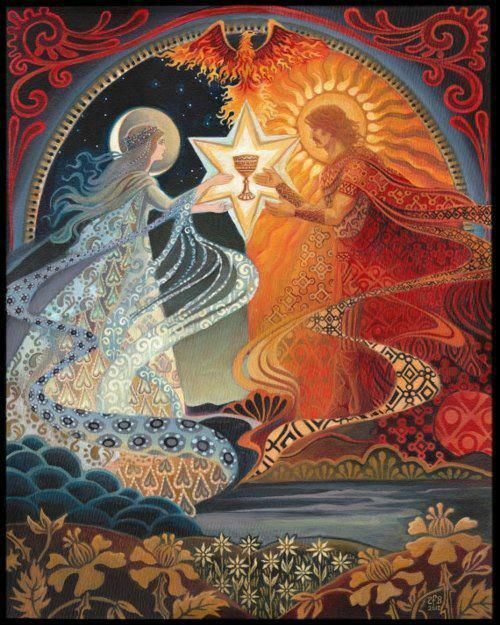 There is a sacred point where these two divine principles intersect and give birth to the union of spirit and matter - known as the heavenly Rose in esoteric teachings . Because we have been so predominantly of the mind in the past cycle of creation we were not able to access the plane which represents the stairway to heaven. With only the mind functioning we were trapped in the dense, dualistic world of matter without a strong connection to the vertical axis found in the heart. 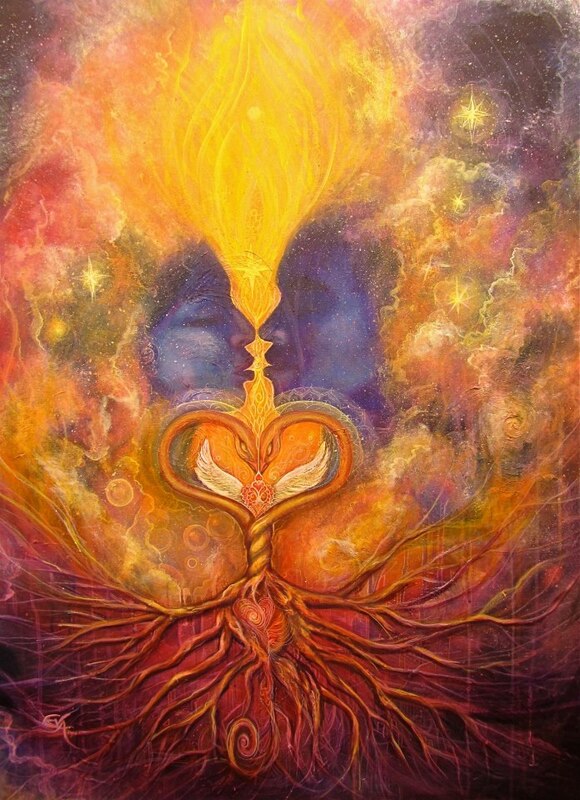 Primordial Adam represents the mind and Primordial Eve represents the heart. In the Kabbalah these two divine principles are known as the fire triangle and the water triangle - the solar and lunar principles. Their interlacing is represented by the Star of David. Both exist within each soul and yet there is a strong resonance to one or the other through the vessel of the body. The collective woman, who is a representation of Primordial Eve, holds the resonant field of Love within her aura. Because this field was distorted into something that it is not, access to the higher world was cut off from our awareness in both man and woman. In order for us to give birth to the heavenly Rose, both planes must be operative and in harmonious relationship to one another. There is Great Work to be done in both the collective man and woman; however, because there was an intense repression of the feminine principle, there is a specific collective healing taking place within Eve. As she flowers in her remembrance of her true nature she will awaken something that has been sleeping on earth. This is the divine Dance, the celebration of Life, the honoring of the sacred formless Spirit that animates all Life. When the heart of the human race is healed, our mind will be elevated once again to experience the Reason and Intelligent Consciousness of the higher worlds. Recording for the weekly Art of the Feminine call with Shannon Port on 02.06.2013: Understanding the Divine Feminine. This call addresses how the Divine Feminine works in both man and woman and why we are remembering our connection to Her at this time.